Do you like fantasy novels? Do you like swashbuckling tales? Are you a fan of the Temeraire series by Naomi Novik, or the seafaring tales of Horatio Hornblower? Okay, good. 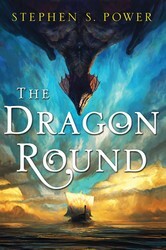 You should pre-order The Dragon Round by Stephen S. Power. It comes out in July from Simon and Schuster, and I am so very, very sorry that it doesn’t come out until then because I want you to read it now and not have to wait. I want people to talk about how good this book is with me. I’m reading it now, as an e-galley. So far, I have: almost missed my subway stop, and also stayed up way too late past my bedtime because I wanted to know what happened next. It’s an impressive level of worldbuilding, including well-described seafaring culture and business/political machinations! That’s unique for a fantasy novel. I’m impressed, but not surprised by the way the world works and the attention to corporate detail. Because, full disclosure, I know Stephen from his work at AMACOM, where he is a Senior Editor. When I was working there as a publicist, sticking my head in his office to talk about comics and scifi brought delight to my workday. So, I know he knows corporate culture. What makes The Dragon Round such fun, though, is that he’s given the worldbuilding better heft by exploring how business-driven culture could become in a world with sea trade and dragons. Instead of amorphous “political intrigue,”that sometimes comes with a fantasy realm, the plot feels real and grounded in motivations that ring true to a business system. It’s well done! Stay tuned for an official review, closer to publication date. But seriously, pre-order this book now.